This was a spontaneous shoot, we just showed up and winged it (I was happy I brought that coat). Jane, besides being a delight to hang out with, remains my favorite model. 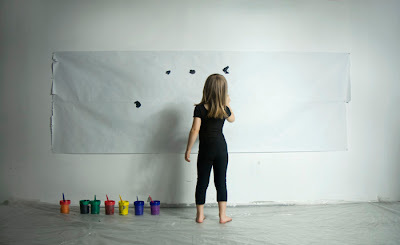 It was fascinating watching a five year old paint a large painting. Applying the paint was such a physical act. 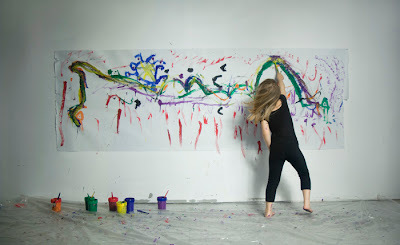 I liked how while she was applying the paint she would also spontaneously explain what she was creating. It's an amusement park, the big curvy line in the middle is a rollercoast, the blue circle thingy is a faireswheel and the short lines are people (red adults, purple kids). A lot of great things are happening this year. First off my second NYC gallery show is taking place this month (first one was in February). Nothing fancy, it's a group show but I was happy to be displaying my stuff in Manhattan. I also got my stuff into a group show that will be displayed in three different galleries. Two of the shows are in Virginia and one in Milan Italy. Last but not least I was super psyched to get an image into Spectrum 16. I've always greatly admired the art work coming through Spectrum and am very happy to be part of it this year. I was actually surprised to be accepted since most of the work is usually illustration based but I noticed that they do except photography so I thought I'd give it a shot. The book is coming out in November. Besides of that I'm taking a few great trips. My first trip starting at the end of the month. On a random side note. I saw "La Vie En Rose" (a movie about Edith Piaf) last night. Wow, did Marion Cotillard deserve that Oscar for best actress! She was phenomenal in that role and what a well executed film. That's it..... have a great day.... go create something.